LA JOLLA–(MAY 7, 2018) Not all of your genome needs to be active at any given time. Some regions are prone to hopping around the genome in problematic ways if left unchecked; others code for genes that need to be turned off in certain cells or at certain times. One way that cells keep these genetic elements under control is with the chemical equivalent of a "do not use" sign. This chemical signal, called DNA methylation, is known to vary in different cell types or at different stages of cellular development, but the details of how cells regulate exactly where to put DNA methylation marks have remained unclear. Salk scientists studying plants discovered a small family of proteins that control where in the genome DNA methylation marks are added. Their work on this aspect of genetic regulation is highly relevant for processes that range from normal development to cellular defects and diseases, which can arise due to erroneous DNA methylation patterns in plants and/or humans, respectively. Their paper appeared in Nature Genetics on May 7, 2018. "If we want to understand how differences in DNA methylation patterns can cause developmental defects in plants, or diseases like cancer in humans, we need to understand how DNA methylation is targeted to specific regions of the genome under normal conditions," says Salk Assistant Professor Julie Law, senior author of the paper. "Until now, factors able to control methylation in such a precise manner have been elusive." Law studies an easy-to-grow weed, Arabidopsis thaliana, the first plant to have its genome sequenced. 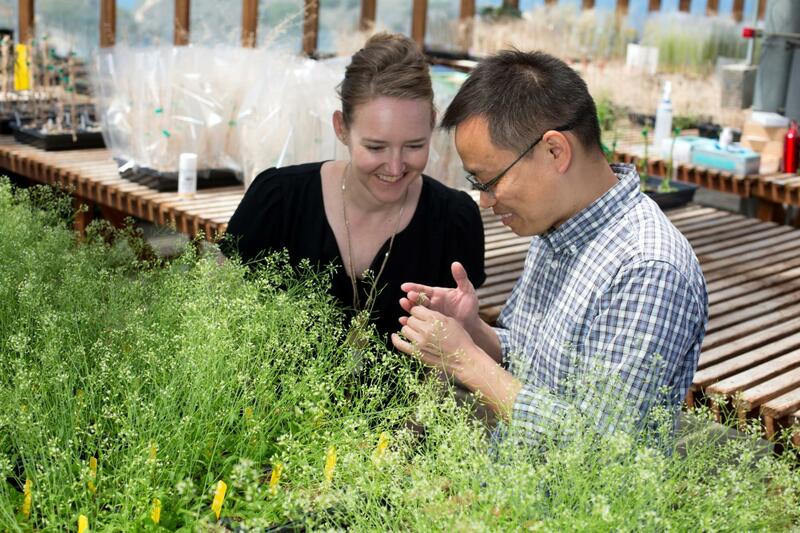 In the ensuing years, scientists, including Law, have been working to characterize and understand the plant's DNA methylation patterns, which affect gene activity without changing the DNA code itself. This process is similar in plants and animals, but investigating DNA methylation in Arabidopsis is much easier because plants can tolerate methylation defects better than animals, where global changes in methylation are often lethal. Law was interested in understanding how the pathways that control DNA methylation are regulated not only to control global patterns of methylation but also to enable the regulation of individual regions–a critical step in generating different patterns of DNA methylation within a given organism. Previously, it was known that a protein complex called RNA polymerase IV (Pol-IV) played a global role in establishing DNA methylation patterns. This polymerase makes small molecular messages called siRNAs that act like a molecular GPS system, indicating all the locations within the genome where methylation should be targeted. However, how this polymerase might be regulated to control DNA methylation at individual genomic locations was unclear. To address this question, Law's lab used a combined genetic-genomic approach to investigate the functions of four related proteins, the CLASSY family, that they thought might regulate Pol-IV. It turned out that disruption of each CLASSY gene resulted in different sets of genomic regions–in different locations–losing their siRNA signals, resulting in reduced DNA methylation levels. More dramatically, when all four CLASSY genes were disrupted, the siRNA signals and DNA methylation were lost throughout the entire genome. "In the CLASSY quadruple mutants, the Pol-IV signal completely disappears–essentially no siRNAs are made," says Ming Zhou, a Salk research associate and the paper's first author. "This is very strong evidence that CLASSYs are required for Pol-IV function." When Law's team probed further, they discovered that the DNA methylation defects in the CLASSY mutants caused some genes to be erroneously turned on and resulted in global decreases in methylation at mobile DNA elements, increasing their potential to move around and disrupt essential gene activity. "The CLASSYs are a part of a large superfamily that is common to both plants and animals," adds Law, who holds the Hearst Foundation Development Chair. "We hope that by understanding how specific methylation patterns are generated in plants, we can provide insights into how DNA methylation is regulated in other organisms." Knowledge of this mechanism for regulating DNA methylation could help scientists develop strategies for correcting epigenetic defects that are associated with reduced yields in crops, or diseases–such as cancer–in humans. In the future, the lab is interested in exploring how DNA methylation patterns are controlled during development and in response to the environment. The work was funded by the National Institutes of Health (GM112966), the Hearst Foundation, a Pioneer Fund Postdoctoral Award, the Glenn Center for Aging Research at the Salk Institute, the National Cancer Institute (CCSG: P30 014195), L. and C. Greenfield, the Chapman Foundation and the Helmsley Charitable Trust.